Get Involved & Help Pets at PACC! PACC accepts donations of new or gently used pet supplies such as beds, bowls, toys, leashes, collars, flat sheets, fleece blankets, and more! The shelter also accepts donations of wet or dry dog and cat food—a lot of which is used in our Pup in Boots Go Kits outreach program. You can shop the Pup in Boots Go Kits wishlist by clicking here. You can shop the shelter’s general wishlist by clicking here. And be sure to shop through Amazon Smile and name Friends of Pima Animal Care Center as your charity to get a percentage of your purchase sent right back to the pets. To make a monetary gift to Friends of Pima Animal Care Center, click here. 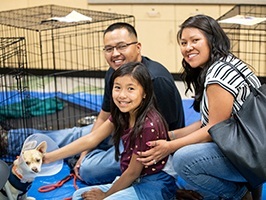 Volunteers are an essential part of saving pets at PACC. In 2018 over 1,200 volunteers donated 80,240 hours—that’s the equivalent of over 40 full-time staff members! We simple could not save as many lives without them. At the shelter, there are volunteer opportunities for everyone! We are always looking for dog walkers, cat socializers, administrative help, and more! To learn more and apply today, click here. Friends of PACC also has occasional volunteer opportunities for tabling at events and administrative work. You can email info@friendsofpacc.org too join us. Can’t adopt? Still want to make a huge difference in the life of a shelter pet? You should foster! You can take a foster pet home for as little as an afternoon to as long as several months depending on your lifestyle and the pet’s needs. Fostering a pet in your own home gives them a much-needed break from the shelter. As a foster parent for a homeless pet you will get to see him or her blossom in a home environment and learn valuable information about the pet’s personality and behavior—information that will ultimately make the pet more adoptable once they return to the shelter. We are always in need of fosters for pets of all types, ages, size, and medical needs. Please click the button below to learn more about fostering and how you can save a life! They say you can’t buy love, but we know you can adopt it when you open your home to a shelter pet in need. Homeless pets are grateful, loving companions that bring joy and enrichment to our lives. With over 17,000 pets coming into PACC every year, there is an endless variety of cats, dogs, and more that are waiting to meet you right now! Click the button below to learn more about adopting from PACC and to see all of the available pets at the shelter. Thank you for saving a life!